New York — The U.S. Army Corps of Engineers, New York District announced completion of the emergency restoration of the Atlantic Ocean’s Gilgo Feeder Beach in the Town of Babylon, Long Island, to restore coastal storm risk reduction measures that reduce the risk of barrier island breaches and protect critical infrastructure. The work restored the beach that protects the undermining of Ocean Parkway — a critical transportation corridor that serves as an evacuation route during coastal emergencies for the residents of the surrounding communities. “The completion of this emergency shoreline restoration contract is absolutely critical for the residents and surrounding communities of the Town of Babylon.” said Col. Thomas Asbery, commander, New York District. Col. Asbery noted the interagency teamwork necessary to develop an efficient and innovative approach to execute the work so that multiple benefits accrued. “This project exemplifies synergy, we were not only able to provide coastal storm risk reduction benefits but we were able to beneficially reuse 1.8 million cubic yards of dredged sand from the inlet and navigation channel, that restores safe navigation for the U.S. Coast Guard, recreational vessels, and residents of these communities, and create additional habitats that can be used by endangered bird species for feeding and nesting. I’d like to thank our partners at the local, state, and federal level for their support and share their enthusiasm for the success of this project,” said Col. Asbery. The contracted work involved dredging approximately 1,800,000 cubic yards of accumulated sand from Fire Island Inlet, including its navigation channel. 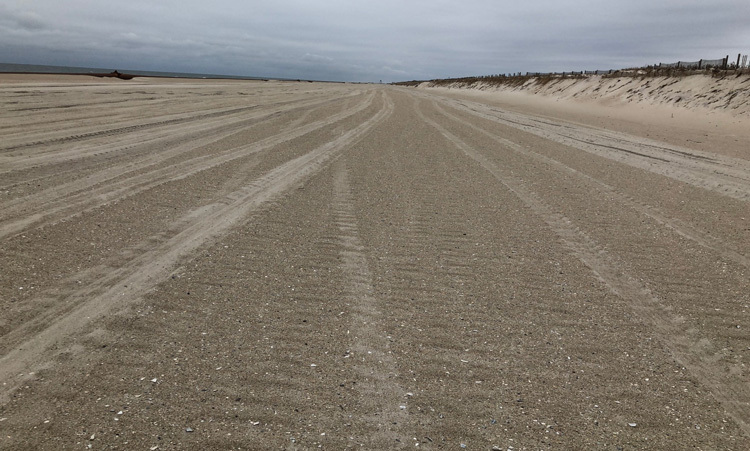 The dredged sand was pumped 2.5 miles to the west of the inlet in order to restore the 3.5-mile-long Gilgo Feeder Beach which had incurred serious erosion due to last winter’s four nor’easters. Sand naturally moves within the coastal systems along the Atlantic Ocean shoreline on Long Island from east to west, from Montauk Point west to Coney Island and Norton Point. The Gilgo Feeder Beach shoreline on the Atlantic Ocean is a naturally eroding area. The sand lost from Gilgo Feeder Beach moves westward to nourish the westerly beaches to Jones Inlet. As a feeder beach, its shoreline requires periodic sand replenishment using sand trapped in Fire Island Inlet. Pursuant to Public Law 84-99, the emergency restoration work was requested by the State of New York Department of Environmental Conservation, and completed by the Great Lakes Dredge and Dock Company of Chicago.